The U.S. Supreme Court this week will take on one of the most significant issues in recent American history: a challenge to President Barack Obama's health-care overhaul hated by opposition Republicans. The U.S. Supreme Court this week will take on one of the most significant issues in recent American history: a challenge to the health-care overhaul central to President Barack Obama's legacy and hated by opposition Republicans. What it decides will affect nearly every American and could have a huge impact on the November presidential election. Obama staked the first years of his presidency getting the overhaul passed by Congress, then fully controlled by his fellow Democrats. Republican voted against it, and the party's presidential and congressional candidates have unanimously pledged to repeal it if they prevail in the November election. David Zoltan, 33, a diabetic who lost his sales job during the recession, is now covered under a federally funded health plan for people with pre-existing conditions. 'It's life to me,' he says. 'Now I can get my medicine.' (M. Spencer Green/Associated Press)The court has acknowledged the importance of the law, the Patient Protection and Affordable Care Act, by scheduling more time for arguments than on any case in more than 45 years. Government lawyers and those representing the 26 states and private parties opposing the law will have six hours over three days beginning Monday to hear arguments. The biggest issue before the nine justices is whether the government can require Americans to acquire health insurance. The United States is the only major industrialized and developed country that does not provide citizens with health care, instead relying on the market place of private insurance companies. Americans spend far more per capita on health care, and, most studies show, the outcome falls short of that in countries with national health-care programs. A national health-care program has been on the U.S. agenda for decades, in particular under the Richard Nixon administration of the late 1960s and early 1970s. But changes such as those achieved under Obama had always been beaten back by opponents to government involvement. The health-care overhaul, denigrated as "Obamacare" by its detractors, is vastly complicated and most provisions of the law will not take effect until 2014. Polls consistently show that at least two-thirds of Americans do not support the changes, particularly a provision that forces everyone to purchase health insurance or be subject to a federal fine. Business could also face a fine if they fail to provide employees with insurance. Supporters of the law contend that requirements would expand the market for private insurers to include healthy young people who often forgo buying coverage. That would help compensate insurers for provisions barring them from denying coverage to would-be customers with existing health problems. The new law would also bar insurers from cancelling coverage to customers after they become seriously ill. Both practices now are widely used by insurance companies to prevent losses. The White House says it has little doubt the high court will uphold the law, and that even its opponents will eventually change their tune. "One thing I'm confident of is, by the end of this decade, we're going to be very glad the Republicans termed this 'Obamacare,' because when the reality of health care is in place, it's going to be nothing like the kind of fear-mongering that was done," David Plouffe, a senior adviser to the president, said Sunday in an interview on ABC television's This Week with George Stephanopoulos. The Obama administration argues the insurance requirements, known as the individual mandate, are permissible because the U.S. Constitution gives Congress the right to regulate interstate commerce. It notes that health-care costs consume 17 per cent of the U.S. economy. 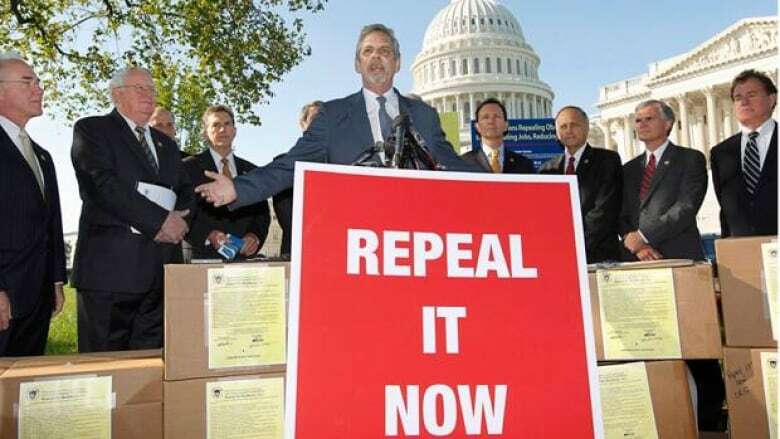 Opponents argue that the mandate unconstitutionally requires Americans to buy a product and interferes with the rights of the 50 states to set their own insurance rules. Federal judges in lower courts have come down on both sides of the question, forcing the issue onto the Supreme Court docket. The suits challenging the law could result in the court and its five-justice conservative majority ruling the entire law unconstitutional or conversely letting it stand as is. The court also could strike down individual portions of the overhaul or delay a ruling for at least two years until the law goes fully into effect. The four liberal-leaning justices on the court are seen as certain to vote to uphold the law, which means it will be left standing if only one of the five conservative justices breaks ranks. The law, as passed, is designed to make sure that most of the estimated 50 million uninsured Americans obtain coverage. Congress has found that when the uninsured go to clinics and hospital emergency rooms, the care they can't pay for costs nearly $75 billion a year. Much of that cost is passed along and ends up adding $1,000 a year to the average family's insurance premium. The law provides federal government stipends to those without coverage and least able to pay health insurance premiums. The Obama administration insists the overhaul will bring down health-care spending nationally. The cost of treatment for health problems and the insurance to help pay for that has been skyrocketing and far outpacing the rate of inflation.